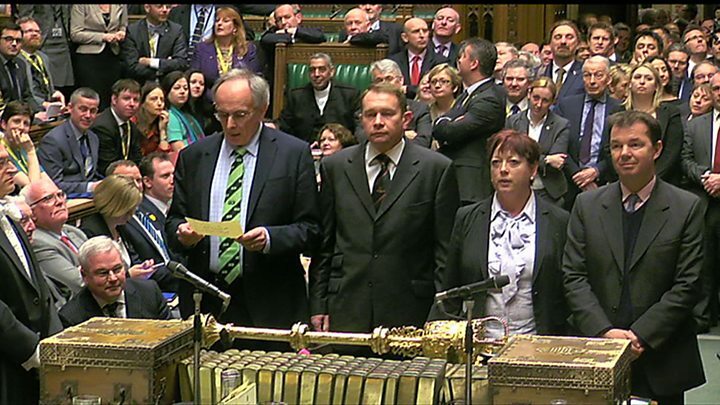 The Commons opposed proposals to allow councils to extend opening hours by 317 votes to 286, as 27 Tories rebelled. Ministers had sought to limit the rebellion by promising to trial the changes in 12 areas but said afterwards they would respect MPs' views. Critics of the plans said they would "chip away" at Sunday's special status and put undue pressure on workers. It is the Conservative government's second defeat in the House of Commons since it was elected last May. The government had hoped to relax existing restrictions on Sunday trading, which limit large shops to opening for a maximum of six hours, by devolving responsibility to local councils. But their plans were thwarted by an unlikely alliance of Labour, the SNP and Conservative backbenchers. Before the vote, ministers indicated they would seek to amend their proposals in the House of Lords if MPs approved them in principle. But while blaming the SNP for the defeat, ministers conceded afterwards the plans would not be resurrected. "We respect the view of the House of Parliament. The Commons has spoken and given a very clear view - we have to absolutely respect that," said the planning minister Brandon Lewis. In the biggest proposed shake-up for 20 years, ministers wanted to give the 353 councils in England and 22 in Wales the freedom to determine opening hours for large shops in their area. During a three-hour debate, a succession of Conservative MPs spoke out against the changes - first announced by Mr Osborne in last year's Budget - and the way they were being introduced. The reason the government lost by such a margin was not just because of staunch opposition from the Labour Party with its 'Keep Sunday Special' campaign, or the principled opposition from many Tory MPs who believe fervently that Sundays are indeed special and should be protected. The government also lost because the SNP objected to their plans, even though in Scotland shops have opened for longer on Sundays for many years. Sir Gerald Howarth said the late offer of concessions had been "shambolic" and looked like they had been "delivered by lastminute.com" while Stewart Jackson said the "dead hand" of the Treasury was responsible for an "egregious and unnecessary confrontation" with Tory backbenchers. Conservative MP David Burrowes, who tabled the successful rebel amendment, said the government had not made the economic case for such sweeping changes, which he said were opposed by businesses of all sizes, shop workers and faith groups. Speaking after the vote, he told BBC News of his "relief", adding: "The main thing out there is relief for shop workers, families and businesses who will really be pleased today." Labour said the government's approach had been "tawdry" and the House of Commons had spoken clearly on the "contentious issue". The Federation of Small Businesses said the outcome was a "major win" for its members. "Our members have been unconvinced of the economic case for relaxing Sunday trading rules and there has been no impact assessment to support the proposals," said the group's policy director, Mike Cherry. "The current system can be seen as a great British compromise which allows families to spend time together, employees to work if they wish to, and provides much needed support for smaller retailers within their communities." The proposed changes were not covered by new English Votes for English Laws provisions, which require the explicit consent of English and Welsh MPs for measures exclusively affecting them, because other parts of the Enterprise Bill apply to Scotland. Video Sunday trading hours: Should shops open for longer?